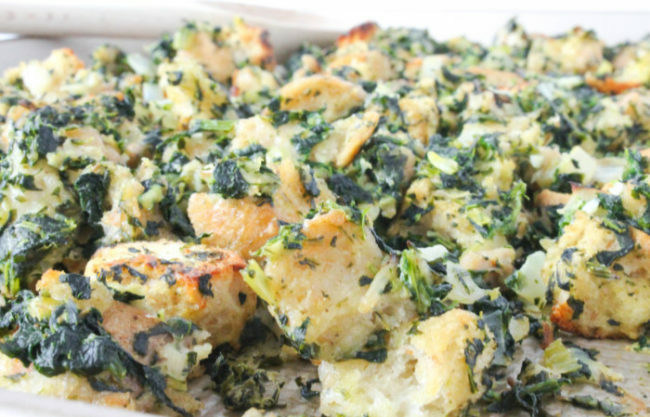 Stuffing goes together with turkey like peanut butter and jelly. Can’t have a day-after-turkey day sandwich without that key layer of leftover stuffing. 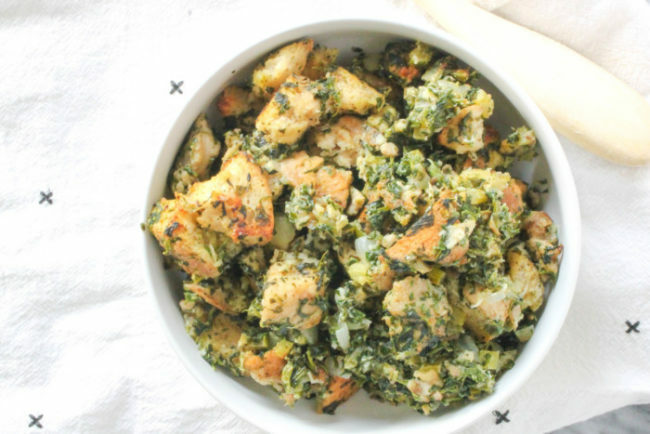 So with Thanksgiving right around the corner, I’m branching out from just dessert recipes to provide you with this delicious Sheet Pan Bread Stuffing with Sausage and Spinach from Julia Turshen’s new cookbook Now & Again in partnership with my friends at OXO. This cookbook features tons of go-to-recipes and endless ideas for reinventing leftovers. That is, if there is any of this sheet pan stuffing left over after you first serve it. It’s no secret that my kitchen is chock full of versatile OXO products that I use year round. I no longer hate chopping onions or mincing garlic since I got myself the chopper a few months ago. From baking the perfect pie to setting the kids table, OXO has tips and tools to honor traditions, create new ones an celebrate the spirit of the holiday all month long. There were a few very helpful tools that I used in making this recipe. OXO’s patented angled measuring cup let’s you measure accurately from above. And how cute and teeny are they? Perfect for my small apartment. If you want to enter a potato peeling contest this Thanksgiving, you definitely need this swivel peeler, which easily peels tough-skinned fruits and vegetables, and the soft, oversized handle is designed for repetitive strokes. If you’re like me, fresh is best, and I love fresh herbs but I hate when they go to waste! This Greenaver Herb Keeper allows for proper airflow, controlled humidity and hydration for your herbs to thrive. And last but not least, these Chef’s Squeeze Bottles ended up being one of my favorite new apartment gadgets. Instead of having to keep giant bottles of Olive Oil + Vegetable Oil in my tiny apartment cabinets, I filled these up and they were so easy to perfectly drizzle oil on the pans when cooking. Trust me when I say that I haven’t met an OXO product I don’t genuinely love. This recipe tasted like the holidays for me since I grew up eating my Grandma’s Italian fennel sausage stuffing at the holidays. 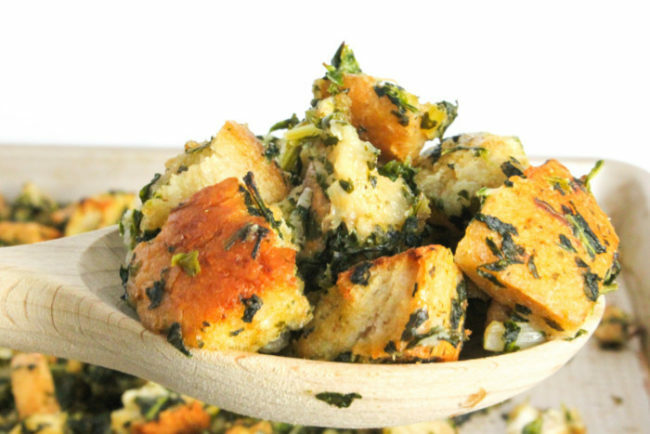 I liked using freshly toasted sourdough bread in this recipe instead of the typical loaf of store-bought stuffing bread I’ve used for stuffing recipes before. Baking the stuffing on the sheet pan left more of that desirable crispy edge that I always seek out when snagging the first serving of stuffing at the table. The best part is you can definitely half this recipe if you’re cooking for yourself or a small group. I bought a small loaf of sourdough from Whole Foods and fresh chicken sausage, and halved about everything with the exception of only one egg and it came out flavorful and crispy. So if you are looking for a new crispy and delicious stuffing recipe this holiday season give this super simple Sheet Pan Stuffing recipe a try. Enjoy! Since stuffing rarely appears separate from Thanksgiving, it's an inherently nostalgic and meaningful dish. I bake this stuffing on a sheet pan so the crispy-to-soft ratio is basically one to one. If you prefer it softer, bake it in a smaller vessel like a baking dish. Meanwhile, put the olive oil into a large pot over medium-high heat. Crumble in the sausage and cook, stirring now and then, until all of the fat is rendered and the meat is crisp and browned, about 15 minutes. Add the onions, celery, garlic, and 1 tsp salt to the pot and turn down the heat to medium. Cook the vegetables, stirring now and then, until slightly softened about 10 minutes. Add the sage and stock and turn the heat to high. Once it is at a boil, turn off the heat. 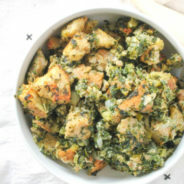 Stir in the spinach, parsley, and reserved bread. Taste the mixture and season with salt if more is needed. Add the eggs and give everything one good final stir. Line the sheet pan you toasted the bread on with parchment paper. Transfer the stuffing mixture to the pan and spread it out in an even layer. Dot the top with the butter. Bake until the top is browned and the edges are nice and crispy, about 25 minutes. Serve hot.